Europe’s biggest telecom operators including Deutsche Telekom, Telefonica, Telecom Italia, Turkcell and VimpelCom are preparing the sale of billions of Euros of mobile towers as infrastructure investment appetite increases across the continent, according to specialist news provider TMT Finance. Telecom tower sales have been increasing across Europe for several years as mobile operators look to offload infrastructure and raise funds for new digital revenue streams. However, the current wave of deal activity has also reached a new level as infrastructure investment funds and pan-European towercos such as Cellnex compete for assets and consolidate the market. “It is now time for major towercos to expand their coverage across Europe and enter new markets. Over the next two years, we should see the big players consolidate their positions and implement a more global strategy,” a banker said. TMT Finance, which specialises in exclusive off the record news for senior executives, is reporting live towerco sale processes happening in France, Spain, Germany, Russia and Turkey, and thought to take place later in the UK, Poland, Czech Republic or the Nordics. 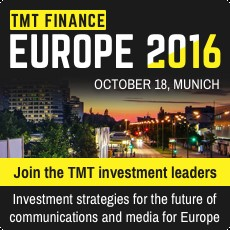 Senior executives from leading towercos, as well as other telecom, media and technology companies, private equity investors, investment bankers and advisers are meeting in Munich on October 18 to assess the latest investment opportunities at the annual TMT Finance Europe 2016. Over 60 speakers and 250 delegates are expected at the event which includes sessions dedicated to Mobile Towers Investment Strategies, Mergers and Acquisitions and financing. Other key sessions at the event include TMT Leadership, Media and Convergence, Hosting Cloud and Datacentres, M2M and the Internet of Things. C-level executives from Telefonica, Tele2, Telekom Austria, Play, VimpelCom, M7, Cellnex, Emitel, Beyond, Engage Sport Media, Linklaters, Wooga, HandyGames, Credit Agricole, Dentons, Index Ventures, UFA Sports, CEE Equity Partners, HgCapital, JP Morgan, Raiffeisen, Societe Generale, Deutsche Bank and ING are among those represented on the programme.